Time for another biking adventure. As I may have mentioned before, we are lucky enough to live on the Youghiogheny Bike Trail. This trail is a rails-to-trails project that was started in the 1980s to make use of unused railways by stripping out the rails and ties, and replacing them with a crushed limestone pathway that is about 15 ft. wide which can easily accommodate bike traffic in both directions. Because these trails follow the course of the railways, they typically follow rivers, are picturesque, and have very gentle grades. 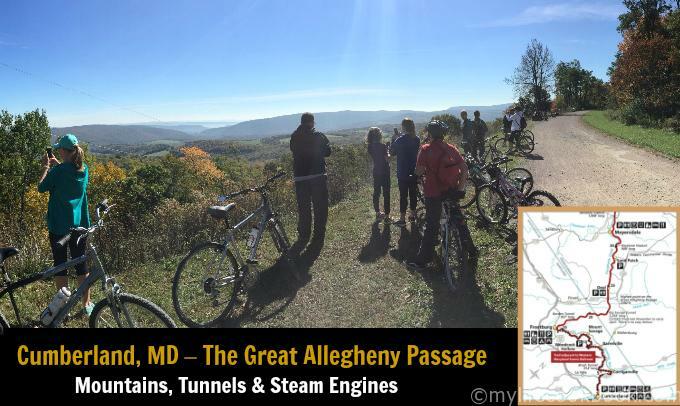 The Yough trail is part of a greater system of bike trails that extend from downtown Pittsburgh, past Rick’s house, and off to the southeast toward Washington DC. It is not unusual in the summer and early fall to see bikers laden with huge saddle bags making the 335 mile trek to the nation’s capital. I hope to join them someday when Max gets a little older, and before I get too old. It sure was a great trip with great friends. Awesome post Rick! Thanks for setting it all up Lisa!